Rebecca Traister on women’s activism—before and after the Kavanaugh hearings. Rebecca Traister writes for New York magazine and Elle, as well as The Washington Post and The New York Times. Her new book is Good and Mad: The Revolutionary Power of Women’s Anger. This interview has been edited and condensed. Listen to Rebecca Traister on the Start Making Sense podcast. Jon Wiener: The New York Times page-one headline after Brett Kavanaugh’s testimony read, “A Nominee is Rescued By a Display of Rage.” I wonder if you have any comment on that. Of course, those founders who were so angry about being taxed and policed without being represented in government built the new nation on a lack of representation: enslaving African Americans, wiping out the native population, leaving women with all kinds of barriers to fill—legal, economic, political. Those who were left out of the nation’s equality of representation expressed rage that in many ways echoed the founding rage: From the early labor movement in Lowell, striking mill girls talked about their anger at poor working conditions, borrowing the language and ideas from the founders. MumBet, an enslaved woman in the 18th century in Massachusetts who would later be known as Elizabeth Freeman, lived in the home of an active revolutionary politician. She heard the revolutionary rhetoric in her home and she applied it to her own situation and petitioned for her freedom. Her case became the basis for the abolition of slavery in Massachusetts in 1783. But often the anger of people who are not powerful white men is disregarded: marginalized, made to sound hysterical or animalistic or infantile or threatening, depending on who it’s coming from. In this past couple of weeks, during the Brett Kavanaugh hearings, we’ve seen all kinds of examples of the rage of the powerful white man, not just Kavanaugh but also Lindsay Graham, Donald Trump, and other members of the Republican party, all of them powerful white men, representing the interests of a white capitalist patriarchy. That rage worked to their benefit. Brett Kavanaugh could go into that hearing room and rage about the injustice that was being done to him. They could all talk about “the mob.” Donald Trump could apologize for the pain that has been inflicted on Kavanaugh’s family. JW: Kavanaugh, we could say, performed anger. Dr. Ford took the opposite course. Lot of people thought she was very effective as a result. What do you think? RT: She was effective, but that’s in part because of the way we’re conditioned to respond to anger differently when it comes from different people. In Kavanaugh’s case, the snarling and the fury could be used to make his point more strongly. Had Christine Blasey Ford employed that kind of anger, yelling, making faces, talking back to people, it would have badly undermined her point. Women aren’t permitted to use anger as a weapon. She was deferential, solicitous, measured, rational. She often talked about how she just wanted to be collegial. That was the mode of expression that she was permitted, if she wanted to be taken seriously. And she did it. JW: Dr. Ford wasn’t angry, but there were some other women who were: to start with, the two women in that elevator, Ana Maria Archila and Maria Gallagher. RT: The two women in the elevator, and the protesters who’d taken over Washington. That protest movement had started before Dr. Ford’s allegations became known to the public. Those protesters in the senate gallery, yelling about abortion and healthcare repeal in the first round of hearings for Brett Kavanaugh, were referred to by members of the Senate Judiciary Committee as “loudmouths” who were displaying “hysteria.” That was Orrin Hatch and Ben Sasse, respectively. Then, after the assault allegations were made, there was a whole new population of protesters who flooded the capital telling their stories. 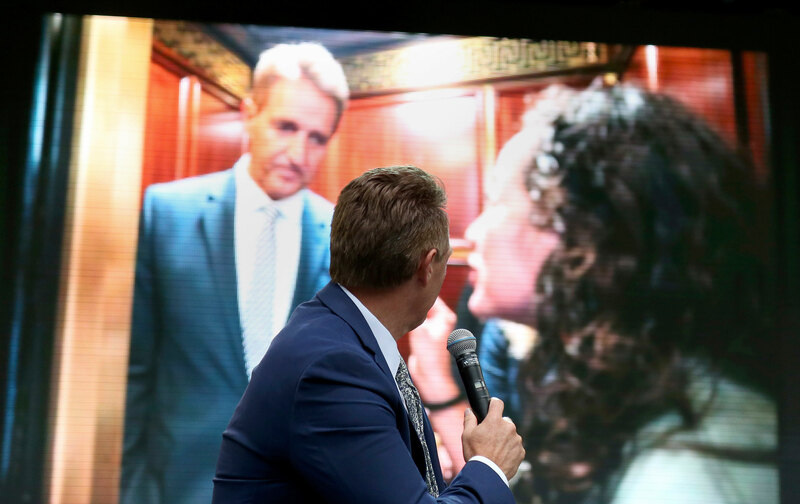 Many of them told really difficult stories of trauma and assault, including Ana Maria Archila and Maria Gallagher, who confronted Jeff Flake in the elevator. There were other survivors: Jess Morales, who confronted Ted Cruz. Alison Turkos, who confronted Joe Manchin. JW: There’s a familiar argument about women’s anger goes like this: By itself, women’s anger can be destructive. Its value comes when it is transformed into something else, namely political action. That’s what makes it important. That’s what makes it worthwhile. What do you think? RT: I think there’s a lot of value in the ability to express anger without fear of censure and recrimination. Many women, of course, don’t have that ability. I also think that women’s anger is often the beating heart at the start of the movements that have radically transformed this country, starting with the abolition and suffrage movements, through the labor movement, the women’s movement, the civil-rights movement, and the LGBT movement. JW: A lot of women’s anger has gone into progressive causes, but not always. Today, we see that not all white women are angry about Trump. In fact, a majority of white women voted for him: 52 percent. Your book has some fascinating data on how women’s voting reveals a stark partisan divide between married women and never-married women. RT: There was a study done by a group of political scientists who found that the closer white women were to marriage, the more likely they were to vote for Donald Trump. Married white women were the category that was most likely to vote for Donald Trump. Next was widowed white women, then divorced and separated white women. But never-married white women voted for Hillary Clinton over Donald Trump. JW: How do you explain that? RT: There are all kinds of ways in which white women are dependent on their husbands emotionally, financially, and professionally, and there is some data that suggests that the closer white women are to white men via their marriages, the more likely they are to vote for conservative policies that fundamentally benefit and uphold a white patriarchy. This is not new in the 2016 election. It should not have been a surprise that white women voted for Donald Trump over Hillary Clinton. In 2012, more of them voted Republican—56 per cent of them voted for Mitt Romney over Barack Obama. Since 1952, when they began measuring this, white women have voted for Republicans in presidential elections every year but two: 1992 and 1996—the Bill Clinton elections. JW: We’ve been talking about white women. What about women who are not white? The other more recent example of this is Maxine Waters. She has always been an advocate for the validity of mass rage in reaction to inequality and violent injustice. Of course she has been angry about the abuses of the Trump administration. On the one hand we have “Auntie Maxine” saying, “I’m reclaiming my time,” which became a useful communicative device for women who aren’t themselves black and who aren’t expressing their own anger but can use the image of Maxine Waters to do it for them. At the same time, in the news media, she is vilified and, in the right-wing media, made out to be really dangerous. She says something like, “I’m going to go get Trump,” and people in the media ask her, “Are you talking about killing the president?,” which of course she wasn’t. JW: Let’s talk about tears of rage. You have a wonderful part of your book where you quote an older woman telling you, “Never let them see you crying.” What was that about?